"Have you ever had one of those experiences when the light bulb just went off? You thought to yourself, 'Now, I get it! That was the lesson I was supposed to learn in all of this!'" 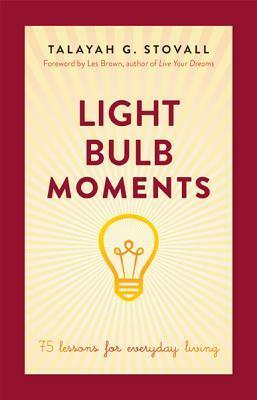 Light Bulb Moments is a collection of 75 lessons learned through everyday life. In each chapter, author, life purpose coach and speaker Talayah Stovall shares personal stories and anecdotes to help guide us through life's ups and downs. Discovering your purpose and passion; developing persistence, hope, patience, faith and forgiveness; setting clear and actionable goals for the future; and understanding the value of friendship and love are among the many treasures found in this wise little book. Lighthearted, warm and compassionate, Light Bulb Moments will inspire you to pursue your greatness and create a vision for your life as you want it to be.